Often what many people think is an allergy is a sensitivity. Such is the case with sulfites, which are preservatives used in wine, beer, medications and many food products. According to Health Canada, true allergic reactions occur with exposure to allergen proteins, and sulfites are not proteins. Sulfites in processed foods help to maintain color, prolong shelf life and prevent microorganism growth. If you are sensitive to sulfites, read labels before consuming food products. Furthermore, avoid eating packaged foods that do not contain labels. Sulfite sensitivity doesn't have a cure, according to Health Canada. Avoidance is the primary precautionary measure. According to the Cleveland Clinic, sulfite reactions are caused by eating sulfite-containing foods, and sometimes by inhaling the sulfur dioxide generated by sulfites. Those who have a sulfite sensitivity typically suffer from asthma, and it is rare for a person without asthma to react to the preservative, according to the clinic, and an asthmatic's likelihood of being sensitive to sulfites range from 1 in 10 to 1 in 20. A sulfite reaction causes symptoms that range from minor wheezing to a potentially life-threatening asthma attack. Rarely, a sulfite reaction causes anaphylaxis, which is characterized by a decrease in blood pressure and narrowing of the airway. According to MayoClinic.com, anaphylaxis is a potentially life-threatening reaction that can occur within seconds or minutes of exposure. Immediate medical help is vital. 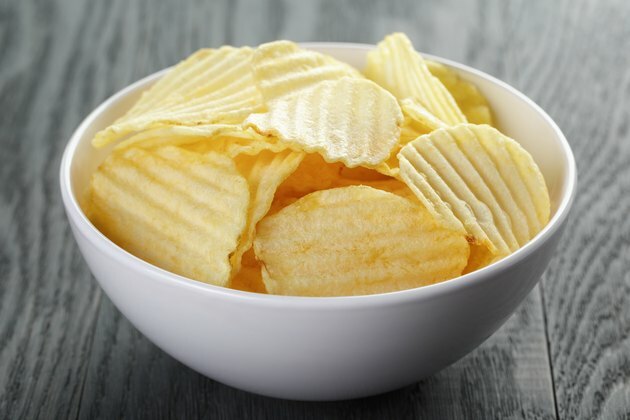 Health Canada lists potato products such as frozen french fries, dehydrated, mashed, peeled and pre-cut varieties as possible sulfite sources. Additionally, Health Canada and the Asthma Center Education and Research Fund list potato chips and tortilla chips as sulfite sources. However, fresh, uncut potatoes were not listed as containing the preservative. As such, if you have a hankering for potato chips, try making your own. Use a mandolin to cut thin layers of potato. Meanwhile, heat canola oil in a cooking pan. When the oil is hot, place a single layer of potatoes in at a time. Remove them when they turn golden brown. Sprinkle them with salt or other flavorings as you like. Most of the foods that contain sulfites are processed. A few of these, listed by Health Canada, include baked goods, cereals, condiments, deli meat, dressings and snack foods. Foods in which you might not suspect the preservative are bottled lemon and lime juice, dried fruits and vegetables, canned and frozen fruits and vegetables, dried herbs, spices and tea, among many others. Health Canada says before eating a food, check the ingredients list for the following: sulfur dioxide, potassium bisulfite, potassium metabisulfite, sodium bisulfite, sodium metabisulfite and sodium sulfite. Some symptoms of a sulfite reaction are flushed face, hives, swelling of the face, throat and tongue, trouble breathing and swallowing, anxiety, distress, cramps, vomiting and even a loss of consciousness. If you suspect you have a sulfite sensitivity, consult with a board-certified allergy/immunology physician. Diagnosing involves what is called a “challenge,” in which sulfites are administered gradually in small doses. If you react to a dose, your lung function will be studied, and the effects will be reversed with bronchodialator medication. If your doctor prescribes you adrenaline for a sulfite sensitivity, carry it with you at all times in case of emergency. The Asthma Center Research and Education Fund: Should I Avoid Sulfites and/or Other Preservatives?